Weather was hot but lots of cars on hand. The MARFC Uniform/Helmet Bag went to Modified driver # 16 Bill Whittington for a run of bad luck lately but will be inducted into the Michigan Motorsports Hall of Fame this year. 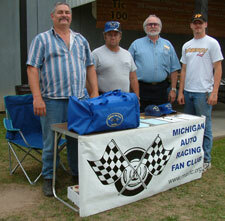 Thanks again for our helpers at the MARFC table Jimmy Tucker, Larry & Kenny Letts. Mother Nature tried to cut it short! Nearly 60 signed in! Thanks to Larry & Kenny Letts & Denny & Kyle Trinklein for their help at the table. 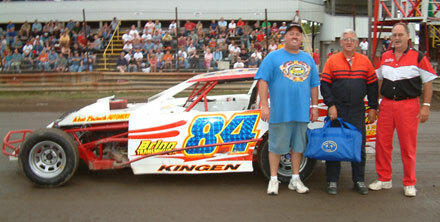 Bob Kingen Modified driver # 84 was presented our MARFC bag for 50 years of racing and now 66 years old and a Michigan Motorsports Hall of Famer to boot. One of our newest member Randy Kinne, presented the MARFC Uniform/Helmet bag to modified driver, Bob Kingen with promoter, Ed Van Duinen (right). Although the Crystal Motor Speedway Fan Club Day on July 2 was eventually washed out, the evening got underway with the presentation of the MARFC Uniform/Helmet Bag by Crystal’s own Ron Flinn, who chose Brennan Bowen to receive the MARFC Bag o Goodies for the fine work he has done in raising money for Juvenile Diabetes. See story below. Small town communities are known to be tight knit so when Rilen Meyers, son of Mike and Colleen Meyers at the Sheridan Elementary, not far from Crystal Motor Speedway, was diagnosed with juvenile diabetes, it shouldn’t be a surprise to understand his fellow classmates have jumped forward to help him. Teachers and students brainstormed and came up with their “Race For The Cure” theme to help raise money for diabetes research. They set up a walking/running course on their playground and began to get donations based on their laps around the course. Central Montcalm’s Sheridan Elementary Principal Dave Steere was amazed at the response. In an effort to spur the kids on and also as a reward for their hard work, teachers began to think how cool it might be to get a real ‘race car’ for them to look at. Enter Brennan Bowen and his B1 Late Model. Bowen has raced at Crystal Motor Speedway and various other tracks for many years. He has felt that a race team needs to ‘give back’ to the community and immediately felt this was a good way to do so. He contacted his advertisers about the idea and one by one, each of those companies donated toward the challenge. He had 14” white stars made up and distributed to the class rooms where each child signed their name to their classes star and then those stars were fastened to the inner deck of Bowens’ machine and will ride with him as he competes during the 2005 season. 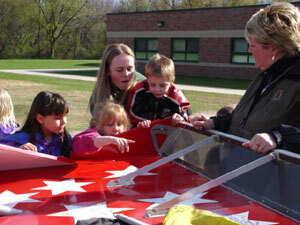 Each class was brought to the car and given time to look it over and ask questions about it. Most students quickly found their class star and smiled with pride as they had their photos taken with the car. All told, about 245 students enjoyed the experience over the course of the morning and afternoon. 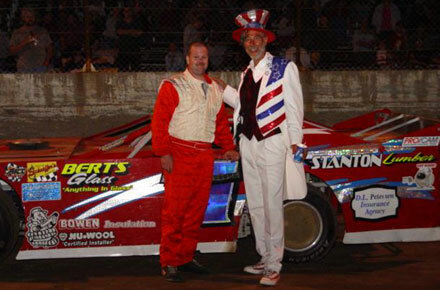 Bowen can be seen competing at Crystal Motor Speedway nearly every Saturday night. A careful observation from the grandstands will allow you to see the stars and if you get down in the pits, make sure you stop over and say ‘hello’ to Bowen and his crew! Now for some facts about this situation: Approximately 35 American children are diagnosed with juvenile diabetes every day. The exact cause of Type 1 diabetes (juvenile diabetes) is still unclear. Juvenile diabetes mellitus is now more commonly called Type 1 diabetes. It is a syndrome with disordered metabolism and inappropriately high blood glucose levels due to a deficiency of insulin secretion in the pancreas. After a meal, a portion of the food a person eats is broken down into sugar (glucose). The sugar then passes into the bloodstream and into the body’s cells via a hormone called insulin. Insulin is produced by the pancreas. Normally, the pancreas produces the right amount of insulin to accommodate the quantity of sugar. However, if the person has diabetes either the pancreas produces little or no insulin, or the cells do not respond normally to the insulin. Sugar builds up in the blood, overflows into the urine and passes from the body unused. Diabetes can be associated with major complications involving many organs including the heart, eyes, kidneys, and nerves, especially if the blood sugar is poorly controlled over the years. The symptoms of Type 1 diabetes (juvenile diabetes) may occur suddenly, and include: Frequent urination, increased thirst, extreme hunger, unexplained weight loss, extreme weakness and fatigue, urinating at night, blurred vision, numbness or tingling in the hands and feet, heavy or labored breathing, drowsiness or lethargy, or a fruity odor on the breath. Any child with the above symptoms needs to be seen and evaluated by a physician well versed in diabetes diagnosis. Although totals are not yet complete, teachers feel they will raise over $2000. Anyone wishing to donate to the Sheridan Elementary kids “Race For The Cure” may call the school at 989.831.2500 and ask for Mr. Steere’s office. MOTHER NATURE WINS AGAIN! Our MARFC Fan Club Day at Kalamazoo has been cancelled. No word yet on a rain date, so keep checking our site.